Courts • Prosecutors says teen is of "sufficient maturity" to be tried as an adult. 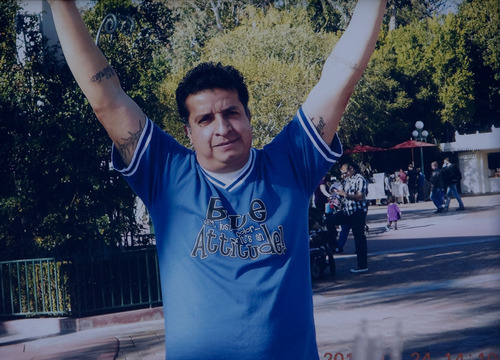 Kim Raff | The Salt Lake Tribune A photograph of Ricardo Portillo, a voulnteer soccer referee who died Saturday of injuries he sustained when police say a player punched him in the head during a game. The teen has been charged with homicide by assault in juvenile court, although prosecutors will ask that his case be transferred to adult court. A 17-year-old boy accused of fatally punching a soccer referee was charged Wednesday in juvenile court with committing a homicide. But Salt Lake County prosecutors are already seeking to move the teen&apos;s case to adult court. The teen  who is not being named by The Salt Lake Tribune because he is a juvenile  allegedly caused the death of Ricardo Portillo with a single punch to the head during an April 27 soccer match at Eisenhower Junior High in Taylorsville. Portillo, 46, of Salt Lake City, died Saturday after nearly a week in a coma. The teen is charged in 3rd District Juvenile Court with third-degree felony homicide by assault. The crime is punishable by up to five years in prison in the adult system. But if the case remains in the juvenile system, the teen could be held in detention until he is 21 years old. Salt Lake County District Attorney Sim Gill said prosecutors believe the teen&apos;s case belongs in an adult courtroom, but he also noted the case poses a "difficult set of circumstances" and there are no easy answers. "We&apos;re trying to balance between a youth who is close to being 18 with the amount of harm that has been caused," said Gill. "You want to balance the status of that youth with the harm that has been caused and the loss that has been suffered by this community." The teen will turn 18 in October. Court officials said Wednesday that the teen has never before been to juvenile court on a criminal or delinquency charge. In a motion to certify the teen as an adult, prosecutors claim the teen is of "sufficient maturity" to be tried in adult court, and that the "likelihood of rehabilitation of the juvenile is minimal." Prosecutors did not elaborate on why rehabilitation might be unsuccessful. Utah law allows a minor over the age of 14 to be certified as an adult during a hearing before a juvenile court judge. Gill said he is certain that when Portillo went to referee that soccer game, he "didn&apos;t think he wasn&apos;t going to go home to his family." An autopsy determined Portillo died as a result of the blow to the head, which caused traumatic brain injury and bleeding inside his skull, according to charging documents released to The Tribune. The state medical examiner&apos;s office classified the man&apos;s death as a homicide, according to the documents. "It was obviously a fatal hit," Gill said. "It was obviously a very aggressive hit that caused [this]." The teen, a goalkeeper playing his first game for La Liga Continental de Fútbol team, was arrested two days after the match. He is being held in juvenile detention. Authorities say the boy was upset with Portillo after the official penalized the teen with a yellow card for rough play. The teen allegedly struck Portillo as the referee recorded the infraction in his official&apos;s notebook. One witness told police that the teen punched Portillo "in the rear jaw area with a closed fist," according to charging documents. After being hit, the volunteer ref fell to the ground and began vomiting blood. Paramedics took him to the hospital, where he fell into a coma. Family members later removed Portillo from life support and donated his organs to waiting transplant patients so he could help others, his daughter Johana Portillo-Lopez has said. An attorney representing the teen declined to comment Wednesday, but noted they are seeking to close the juvenile court proceedings to the public and the media. An arraignment hearing for the teen scheduled for Wednesday afternoon was delayed in response to the motion. A native of Guadalajara, Mexico, Portillo had lived in the U.S. for 17 years and had been volunteering as a referee for eight years. His body will be returned to Mexico for burial, his daughter has said.